Moses is born to a Hebrew family in the year 1525 BC but raised in the palace of Pharaoh Thutmose II. The name Thutmose (also read as Thutmosis) means “Thoth is born”. 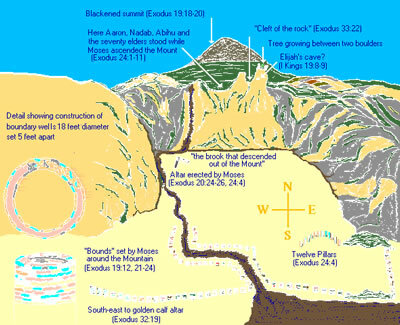 It can easily be seen that Moses was called by his Egyptian family name “mose” through out his life. The name of the Egyptian’s most important deity, Thoth, is dropped from Moses’ name leaving him with the simple ending “mose” or “moses” which means fittingly “born”, “son” or “rightful heir.” Hatshepsut, the half-sister and wife of Thutmose II, would have been the royal princess who took Moses from the Nile. Moses is trained in all the wisdom of Egypt and becomes a great man among the Egyptians. At the age of forty Moses tries to free the Hebrews but has to flee across the desert into the land of Midian. After serving as a shepherd for forty years Moses is called by God to return to Egypt to get the people of Israel. God wants Moses led these men and their families to Mt. Sinai to receive instructions from God. Nile is turned to blood defeating Nilus the god of the river. Hail and Fire demonstrate the lack of control the god of the atmosphere, Shu, has. Darkness proves the inability of Ra, the sun god. On the night the firstborn died God had Israel put the blood of lamb on their doors so the angel of death would Passover their house. The next day Israel left Egypt. After having brought the Israelites out of Egypt in one night God began the long process of getting Egypt out of the Israelites. They passed through the Red Sea into the wilderness as Pharaoh’s pursuing chariots drowned. In a few days and after several tests (bitter waters, manna, quail, water from a rock and an Amalekite attack) Moses arrived at Mt. Sinai with the people of Israel. 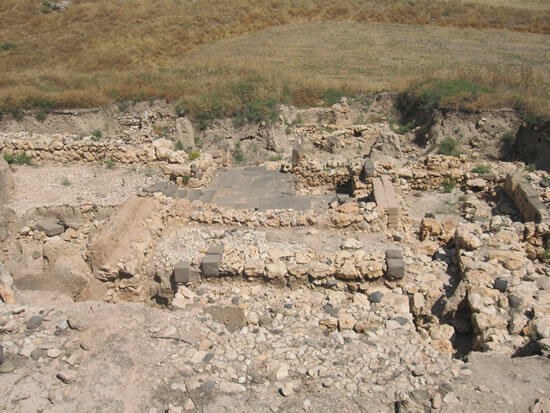 The Mosaic Covenant also included a priesthood and a sanctuary called the tabernacle. 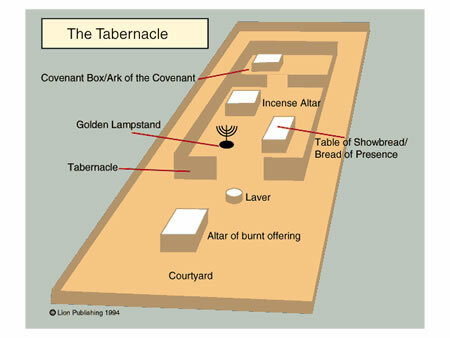 The tabernacle was a tent with symbolic furniture used in ritual worship set up according to the plan shown to Moses by God. Thirteen months (Num. 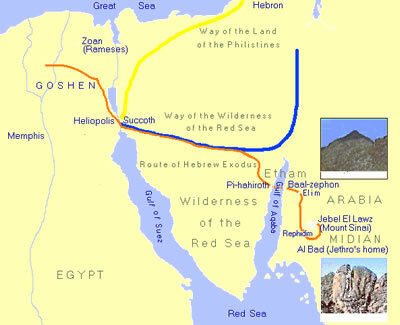 1:1) after leaving Egypt (1444 BC) God led the people away from Mt. Sinai to the promise land. Due to lack of faith and human fear the generation that left Egypt refused to go into the Promised Land. The nation of Israel was forced to wander in the wilderness for the next 39 years (total of 40 years after the Exodus). Then the second generation would be led by Joshua across the Jordan into the promise land. 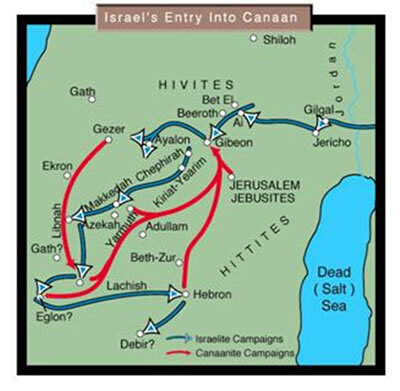 The land of the Canaanites was taken by Joshua and Israel in a five year war (1405-1400 BC) that included four basic campaigns. 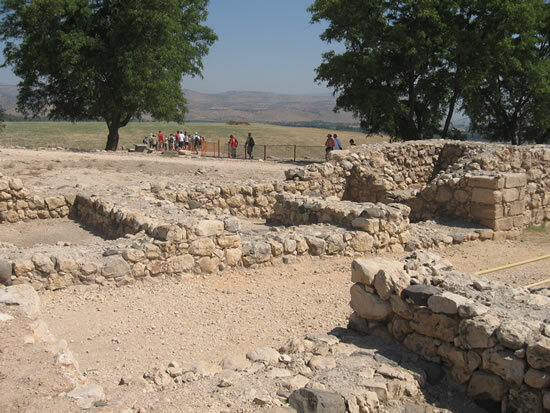 Southern Campaign where Israel takes the cities of Lachish, Gezar, Eglon, Hebron and Debir. 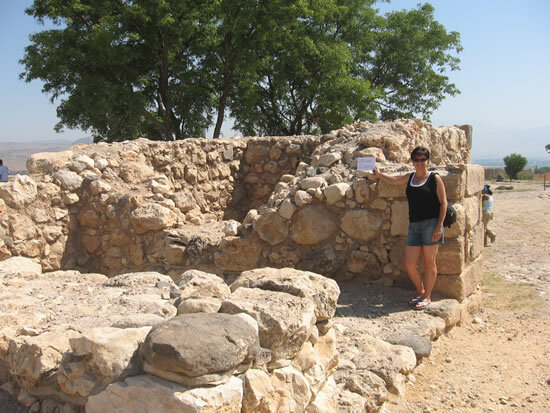 They subdued the hill country, the Negev, the western foothills and the mountain slopes. 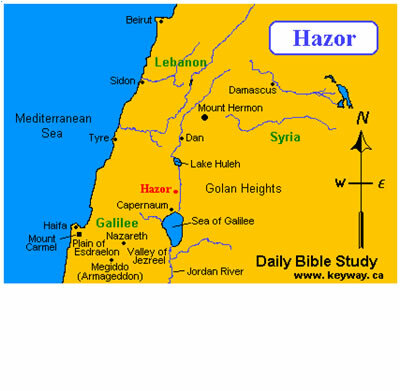 Northern Campaign against Hazor in the north. 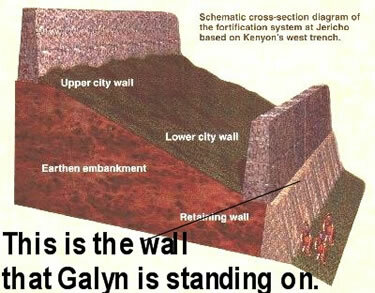 city walls fell in 1405 when Joshua marched around the city. campaign when Israel took the promise land.9 (above). battles, is seen below in northern Israel. 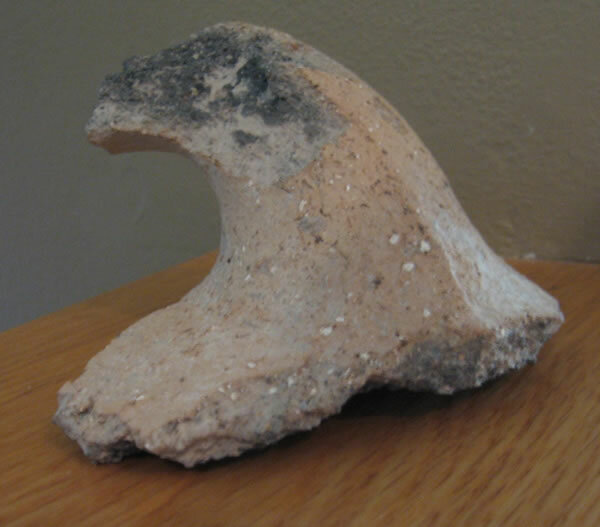 Handle from the above Canaanite palace in Hazor. chambers on the other side of the passage way. six chamber gate seen in the above photo. 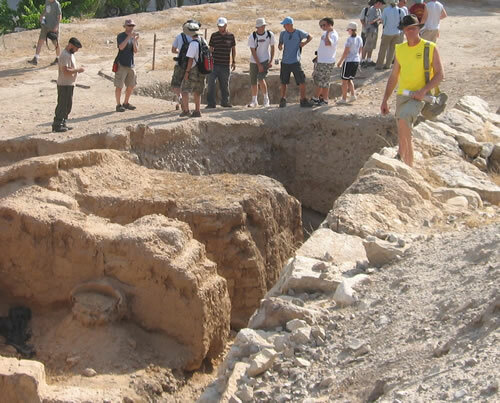 More photos of Hazor can be seen HERE. 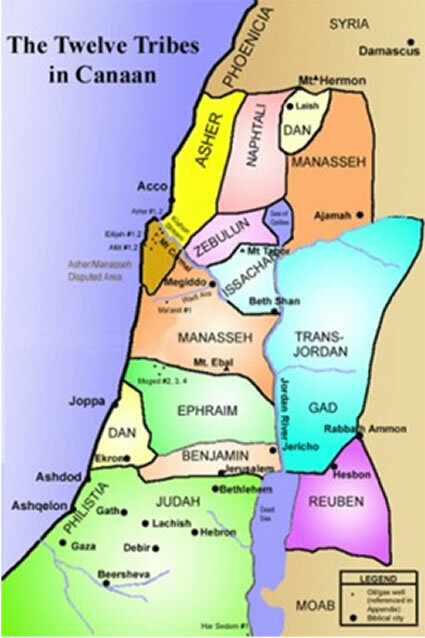 At the end of the Canaanite wars (1400 BC) Joshua divided the Promised Land of Canaan among the twelve tribes of Israel. After Joshua’s death Israel was ruled by God in a government form called a Theocracy. Judges from the twelve tribes would lead for God through word and action. During this time Israel went through periods of blessing for obeying the Lord, abandonment when they forgot the Lord, oppression for rebelling against the Lord and deliverance for crying out to the Lord. 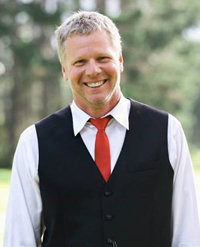 God would often answer their cry for help by raising up a leader or a judge. 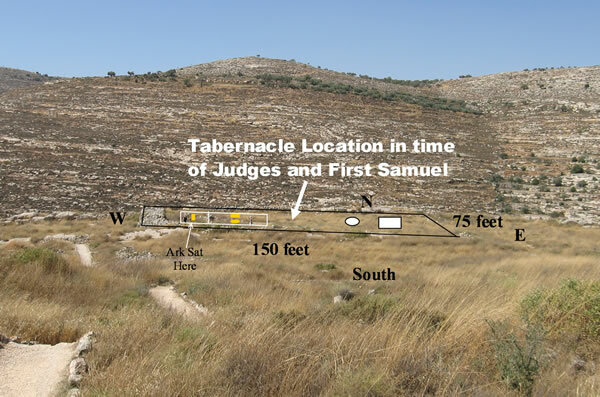 Location of the tabernacle in Shiloh in Samuel’s day. The stone base still remains. Twenty years after this event the people were ready to come back to the Lord and Samuel, who is now about 32 years old assembled the people before the Lord to renew their covenant with the Lord. Samuel then traveled through out the central part of the land as the judge and prophet leading the people. As Samuel grew old the people of Israel asked Samuel to give them a king. The Theocracy was not working because the people would not follow God. Samuel warned them of the problems they would face with a king but the people insisted and God allowed it. The first king chosen was Saul (1050-1010), from the tribe of Benjamin (1 Samuel 9-10). Saul’s first months went very well as he led the people and won battles. But a series of disobedient acts, an arrogant attitude and limited wisdom left Saul rebuked by the prophet Samuel and rejected by the Lord. Although Saul will rule for 40 years his reign was under the constant threat of oppression and invasion by the Philistines. The Spirit of the Lord that had anointed Saul like the prophets and judges before soon left Saul. An evil spirit tormented Saul and left the nation of Israel in a very vulnerable position. Moses was a real, historical figure who lived from 1525-1405. God delivered his people from the land of Egypt so they could become a nation. The Mosaic Covenant included moral duties, civil laws and religious rituals. Joshua led the second generation of Hebrews into the Promised Land. There were a series of four basic military campaigns in a five year period that secured the land for Israel. The Promised Land was divided into twelve portions for the twelve tribes. The Israelites failed to live according to God's standards which led them into oppression by surrounding nations. God would provide a judge to deliver the people when they cried out to him. The time period of the judges was a time of great ignorance concerning God and his plan. This created an cultural environment that allowed many strange and bizarre situations and decisions by people. The book of Ruth occurred during the time of the judges. Samuel was the last judge of Israel and he also served as a prophet who anointed the first and second king. 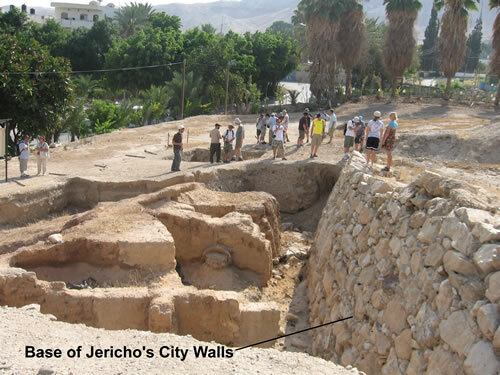 Who was the Pharaoh in the palace that Moses grew up in? Describe the three forty year periods of Moses' life? What three parts can the Law of Moses be divided into? Draw a diagram of the tabernacle. Define Joshua's battles in the Promised Land over a five year period in four campaigns. 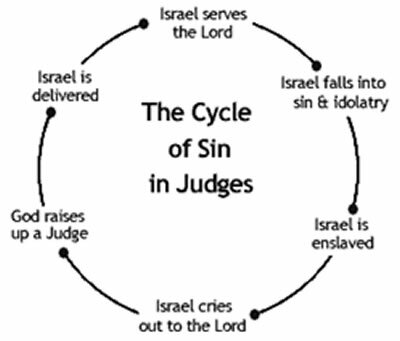 What is the cycle of sin that Israel experienced in the book of Judges? What are some of the bizarre situations and decisions found in the book of Judges?